Most of us have heard the saying “Those who fail to learn from history are doomed to repeat it.” Perhaps it was a warning from your history teacher, but the words resonate. Even more significant is its equivalent: “Those who learn from history are destined to benefit from it.” That’s why fairy tales, legends, parables, and sayings have been passed down through generations. But what can the story of a 12th century Japanese concubine teach a pair of adult sisters in modern day San Diego? As it turns out, plenty. Rachel and Drew Snow have been almost estranged since their father, Killian, threw Rachel out of the house when she was eighteen. Now thirty-eight and thirty-four, Rachel and Drew have come back together to support each other, as Rachel and Killian fight over the power of attorney that their Japanese mother, Hikari, has given Rachel. Hikari is suffering from Alzheimer’s, and Killian wants to put her in the cheapest nursing home possible. Hikari mumbles to Rachel about a book she wants her to have, and Rachel goes through Hikari’s things and finds it. It’s old and written in Japanese. She gives it to a librarian for translation, and learns that it’s a famous Japanese tale of the 12th century female samurai Tomoe Gozen. Tomoe loved the samurai she served as warrior and concubine, Yoshinaka. But Yoshinaka takes a wife, Yamabuki, who quickly gives birth to Yoshinaka’s son. Tomoe is supposed to serve Yamabuki as well, but how can she serve the man she loves, and his wife and son? 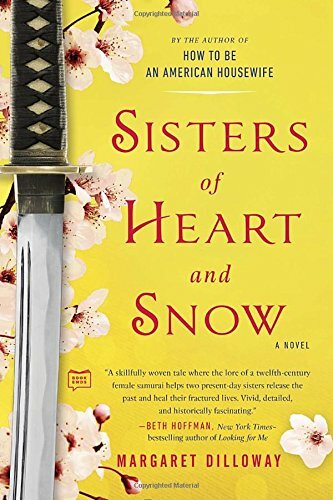 Sisters of Heart and Snow, written by Margaret Dilloway, alternates between present day California and 12th century Japan. As Drew and Rachel go through the book’s translation, they wonder what message their mother meant for them to learn. Tomoe is a fearless warrior, who nonetheless learns from sheltered, pampered Yamabuki. Can Rachel use her example to battle Killian, who married Hikari from a mail-order catalogue and never respected her? Can Drew use her to let down her guard, mend fences with Rachel, and find love? 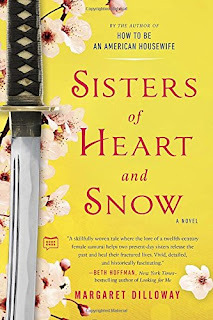 Kudos to Dilloway, who must have spent thousands of hours researching feudal Japan and Tomoe, a real-life Japanese heroine (though whether she really existed or was only the stuff of legend is not known.) The Japanese sections feel like a real, hundred-year-old story. As much as I admired Tomoe, though, I did have trouble following her story. It spans about forty years, and many characters have similar names. I was constantly flipping back and forth to try to remember who’s who. That says more about my aging brain than Dilloway’s writing, though. She adapted a known legend, and therefore didn’t have the freedom to change names for American audiences. Rachel and Drew’s stories take place over a shorter time span, and are much more internal. Along with fighting her father, Rachel also has to deal with her children, twenty-year-old Quincy and fourteen-year-old Chase. And Drew is trying to have her own relationship with them, as well as finding new love. Their characters are richly drawn and very well-developed. While the plot hinges upon their battle with Killian and a secret he may have about their mother, the emotional journey is these two sisters learning to love, trust, and lean on each other again. While the book is not a page-turner, it’s a fine addition to the women’s fiction genre. Fans who appreciate relationship over plot will find this book meets their needs nicely. Thanks to Putnam for the book in exchange for an honest review.